In the 1920’s, milk bars were very popular in Hungary. No, these were not the Korova Milk Bar kind from A Clockwork Orange, but more like places to drink and eat everything that could be possibly made from milk. Cserpes is a modern milk bar, which we owe to Mr. Cserpes who decided to revive the tradition. He believes his mission is to supply the best milky things in the whole country, so after selling milk products in markets, he decided to open his own shop. What does Cserpes offer? Well, they have some Hungarian pastries, for which I have a weakness, túrós batyu being my all time favorite for breakfast. Its name literally means “bundle with cottage cheese”. 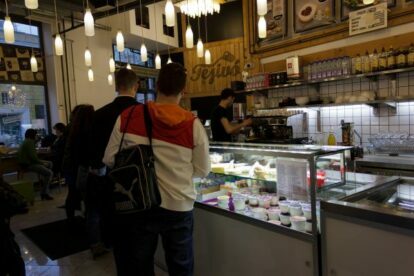 But not only that, the Cserpes milk bars also offer sandwiches with cheese like feta or mozzarella; and also with mangalica ham, made from a special kind of Hungarian pork. This sandwich is great for lunch, filled with veggies and cream cheese. If you feel like eating something lighter, they have a variety of salads too. Cserpes has menus too, but you can also buy everything that the Cserpes factory offers: cheeses, yogurts (plain or with different kinds of homemade fruit jam! ), and of course, milk in various flavors. In wintertime, do not miss their hot sandwiches, hot chocolate and tea to keep you warm! The design of these milk bars is really trendy and fun: milk bottles are hanging from the ceiling and the chairs are little colorful cubes.